Blake’s motorcycle race this weekend was at the Herrin Compound for their 3rd Round of the FrostBite Series. 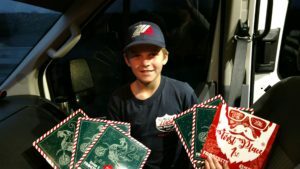 After celebrating Christmas with Mike’s side of the family he and Blake started the 8 hour trip to get to the track. There was great weather for the motorcycle races on Sunday; the high was 78 degrees! Blake entered 6 races and qualifying went well. Except, for the Middle-Weight class, the transponder didn’t get switched to the KTM65 and so Blake would be starting in the back for that race. The first motorcycle race was the Grom Class. The race started and Blake and Ben Brewin checked out from the rest of the grid. Ben was ahead of Blake and that is how the entire race went. Blake took 2nd place on his Honda Grom. Formula 3 Advanced was the next class Blake raced. He was on his Honda Grom once again. This time it was Blake and Damian Jigalov that checked out; they were flying (for a Grom, of course) running in the 42’s. Blake got 2nd place in that race. Blake and Damian Jigalov pulled away again in the Kids Advanced class. Blake was racing his Kayo 125 and finished in 2nd place. The Kayo has been a great bike for Blake’s training. Of course in the Stock 100 Class Blake raced his Honda 100. At the start of the race Blake did a huge wheelie which is not a good thing when you’re racing. Heading into turn 1 he was in 2nd place trying to keep the 3rd place rider behind him. He managed to hold him back and after that bit of excitement held his position for the rest of the race and once again, finished 2nd. Remember in qualifying Blake’s transponder was not on his KTM65 so he started this race in the back. After about the 3rd lap he had made it up into 2nd place but 1st place, Ben Brewin, was still a good distance ahead. Blake managed to run him down and tried passing Ben on the inside of the hairpin turn. Ben dove to the inside, Blake hit his brakes bringing his rear tire way up off the ground and putting a gap between he and Ben. Blake managed to catch back up with him and tried passing on the outside but Ben pushed wide and with Blake right on his rear tire Ben finished 1st and Blake 2nd. That was the best racing of the day for Blake. Good battles make racing fun! Blake’s final race of the day was the SuperMini class on his KTM65. He was 4th off the start but got into 2nd by turn one. Within the first lap Blake was in first and pulled a pretty big gap and finished on the podium in 1st place. A great way to end the day! The FrostBite Series is a great series to race. Through the winter there isn’t as many opportunities to compete so these weekends are highlights for Blake through his “off-season”. 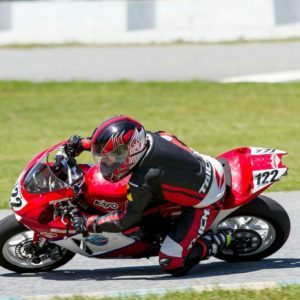 He’ll be doing some more motorcycle racing at Round #4 on January 22, 2017! 2017!!! Can’t wait for all the racing in the new year!